BIZCOMP Corporation announces the immediate availability of Model 1012, a microprocessor-based 1200/300 baud Intelligent Modem. 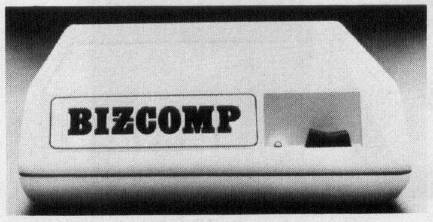 The 1012 features full Bell 212A compatibility and BIZCOMP's keyboard dialing. An integral serial auto-dialer allows keyboard dialing while the low-power, LSI circuit design gives reliable, cool running operation. A Thompson pre-filter assures excellent data integrity. The built-in microprocessor provides a full complement of powerful commands for controlling dialing, auto-answer, self testing and programming modem parameters. Front panel controls have been ergonometrically designed for efficient and simple use by nontechnical office personnel. The 1012 is fully FCC registered for direct connection and is packaged in a stylish, low-profile injection enclosure which may be used as a base for a desk telephone. Applications include remote datastations, store-and-forward electronic mail, computer-computer file transfers and automatic polling of unattended locations.